Six Experiences of the Venezuelan Crisis in "Elsewhere"
Venezuela is a petrostate — a small country which is rich in oil — however, wealth only circulates among the powerful few. Furthermore, petrostates rely on exports instead of taxes, meaning Venezuela’s economy is heavily dependent on oil. Ninety-eight per cent of export income is from oil sales, and 50 per cent of Venezuela’s GDP is made up of oil. In 2013, after former President Hugo Chávez died, the economy collapsed. His successor, Nicolás Maduro, inherited an economic crisis that resulted from dropping oil prices. This financial instability led to immense inflation and a shortage of necessary resources such as food and social programs. In response, young citizens began protesting against authoritative security forces, putting pressure on the government to find a solution to the ever-worsening economic state of the country. The opening night, Thursday January 24, was symbolic for Canadian-Venezuelan playwright Joy Ross-Jones. The day before, Juan Guaidó was sworn in as interim Venezuelan president, replacing socialist leader Maduro. Ten countries, including Canada, have recognized Guiadó as the transitional leader. Hopefully, Ross-Jones stated in her post-performance discussion, this will provide the people of Venezuela access to a fair, non-violent presidential election. One of the most impressive aspects of Elsewhere was the versatility of Ross-Jones’ acting. As the only performer in the play, Ross-Jones took on the role of six different characters. 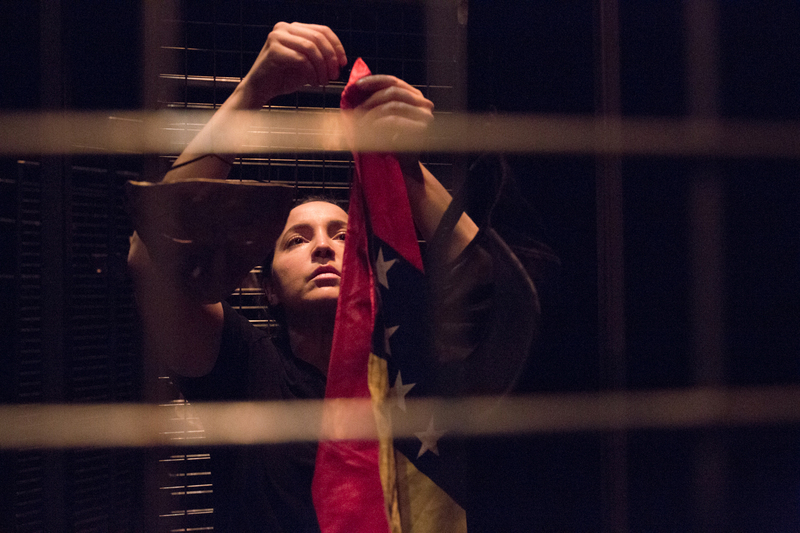 The first character introduced in the play is a Canadian-Venezuelan woman expressing her griefs about the economic crisis. She is conflicted about her own identity, wondering if she is Venezuelan enough. During the discussion, Ross-Jones explained that this character was not based on herself, but instead embodied the anger Ross-Jones has towards the Venezuelan government, and served as a vehicle to address her own questions of identity. The second character is a young protester who remains silent throughout the entire play, his part composed of only actions. He is the only character with more than one scene. The silent protester stands for the citizens who feel voiceless. The third character is a mother and former beauty queen; she at first presents herself as vain, discussing looks and men. However, as her part progresses, she delves into an extremely personal monologue, initially articulating her fear over the safety and well-being of her children. She then addresses the pressures she feels to import goods to sell in order to buy food, and reveals that she is considering a government-sponsored surgery to tie her fallopian tubes. The mother struggles with her decision to get the surgery; she appears confident, but her self-assured persona slowly wavers. Abortion is illegal in Venezuela, and the government announced that they could no longer administer birth control in July 2015 due to lack of resources. Furthermore, a “36-pack of Trojan condoms now costs $755 at the official exchange rate.” A clinic in the Miranda state of Venezuela hosts “special sterilization days,” where free sterilizations are offered. There are 500 women on the waiting list. Considering the insolvent state of Venezuela’s economy, many citizens feel it would be reckless to reproduce in a country without food. In short, taking care of oneself during pregnancy, along with the costs involved with raising a child, is too expensive. Birth control is sold on the black market; it is, however, pricey as well. According to Ross-Jones, the beauty queen represents Venezuela’s history in pageantry and its reputation as a beautiful country, as well as the ways in which this reputation clashes with the current chaotic and desperate state of the country. The fourth character is a cop who shares his internal conflict about occupying an authoritative position and simultaneously holding views opposing those of Maduro. Though often associated with corruption and control; he, like all citizens, is influenced by fear and coerced into silence. Living in an environment of uncertainty and instability, citizens are fearful of the current political situation, as well as violence and punishment. Those who protest are detained and even murdered. According to the United Nations, 40 citizens were killed and 850 detained during an anti-Maduro protest in January. The cop also expresses concern for his nephew, who he suspects has joined a group of young protesters. He describes finding an adolescent boy lying on the ground, wearing the same shirt as his nephew. The cop’s monologue highlights the plethora of narratives and how they are all interconnected. The fifth character is an older homeless man struggling with alcoholism. He recalls his past, along with the love of his life, who had recently left Venezuela. He, like many other characters, expresses his concerns about the shortage of food. The last character is a grandmother, who symbolizes the bridge between the past and present. She speaks of Venezuela during her youth, reminiscing on its beauty and the economic opportunities that were available. The grandmother then transitions into the present, describing robberies she has witnessed and having to wait in line at supermarkets, only to find nothing to eat. Ross-Jones incorporates masks, hats, and scarves to distinguish each character. Despite wearing the same beige cargo pants and black t-shirt throughout the performance, she continuously alters her shirt (i.e. tying it, tucking it in) to fit the persona she is about to embody. The set was simplistic, with long metal rectangles decorating the stage. Most of the metallic structures were accessorized with hats and masks, each one specific to a certain character. Liv Wright, the set designer, said her inspiration derived from the idea of protest. Cold metals reminded her of empty supermarkets and fences. The final scene of the play included Ross-Jones presenting three diagonal lines of red, blue, and yellow ribbon to represent the Venezuelan flag. By featuring the flag colours, the ending moments concluded on a tone of solidarity and pride. The discussion at the end of the show included playwright Ross-Jones, Concordia professor and documentary director Liz Miller, Venezuelan journalist Rafael Osío-Cabrices, the play’s director Cristina Cugliandro, and the Artistic & Executive Director of Imago Theatre Micheline Chevrier. They discussed the importance of including a variety of voices and narratives in storytelling. In doing so, they highlighted the numerous and complex ways in which Venezuelans, both in and outside the country, are affected by the economic crisis. When asked why there was no character in support of Maduro’s regime, Ross-Jones responded that she could not include a perspective which she failed to understand. It is evident that Ross-Jones is speaking from a personal point of view, which imbues the piece with an authentic and genuine sensibility. Despite the heavy subject matter, she managed to incorporate humorous moments throughout the performance. There is no hierarchy between the characters; each person represents a pressing issue. Ross-Jones provides a platform for voices that are currently being marginalized without passing judgement. Playwrights like Ross-Jones are challenging privilege through their art by questioning ideas about who is allowed to speak, both in the governmental system of Venezuela and in a settler-colonial Western context. Western political conflicts are often prioritized in the media over the crises present in petro-states, countries whose resources continue to be exploited. The organizers of Elsewhere ask their viewers to challenge their notions of what constitutes a crisis “elsewhere,” and to recognize the humanity of those affected.